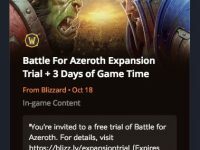 Recently I was sent this gift from blizzard to play 3 days of World of Warcraft free. This was sent out to accounts that have been inactive for awhile, which mine has been because since the latest expansion came out my computer has been unable to play anymore because my video card is no longer supported. At least it’s the thought that counts.